So, any of my readers who are also subscribed to /r/wicked_edge are likely aware of the LA Shaving Soap Company, set up by fellow redditor jbisinla‘s fairly new soap line (up and running for the last 7 months). It’s certainly been gaining high praise, and after trying it I can see why. First off, the lather is great. 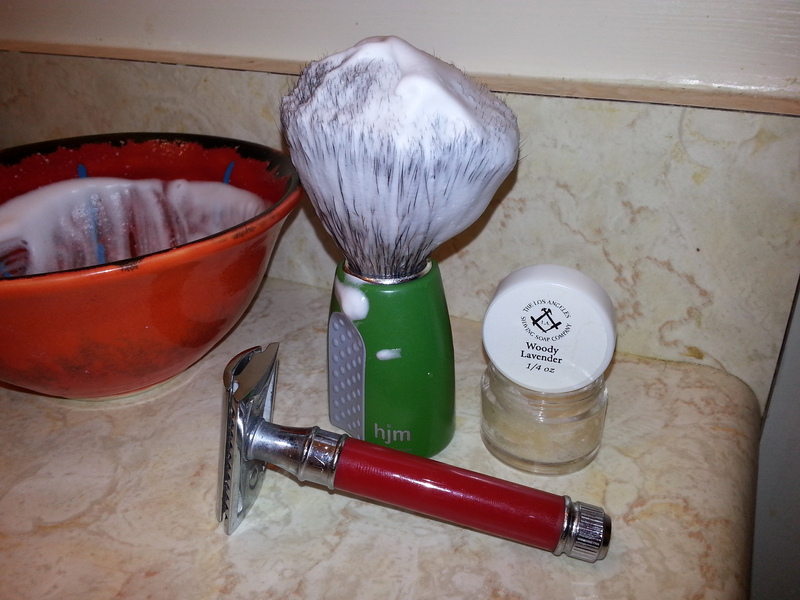 It whips up easily, into a nice thick creamy lather, with some great glide. Not too thirsty, but it seems to have a relatively wide sweet spot, so you’re probably not going to accidentally over-water it. Great stability,and left my face feelin’ nice. The scent is just what it says on the tin; woodsy and lavender. The lavender provides a good contrast to the wood notes base, provided by essential oils of Ho Wood, Amyris (Torchwood) and West Indian Bay. It comes together quite nicely. The strength is what I’d say is just spot on. It’s a nice and strong scent, without being what I’d say is overpowering, with little to no fading during the course of the shave. Overall, definitely worth a 9/10, IMHO. Cost:This scent can be found as one of five scents in their sampler pack. Although availability does seem rather sporadic. Or you can get it in a 4 oz thin tin (increased surface area for easier loading) or a 4.5 oz tub for $16. Bowl: Hand painted by myself (Yes, I know it’s ugly). Ingredients: Vegetable Stearic Acid, Distilled Water, Coconut Oil, Potassium Hydroxide, Vegetable Glycerin, Essential Oils (Lavender, Ho Wood, Amyris, Pimenta Racimosa (West Indian Bay)).